- Chapter 1: Introduction.- Chapter 2. Conceptualising professional identity.- Chapter 3. Methodology.- Chapter 4. Emerging professional identity.- Chapter 5. Mode, access, and agency in participatory learning.- Chapter 6. 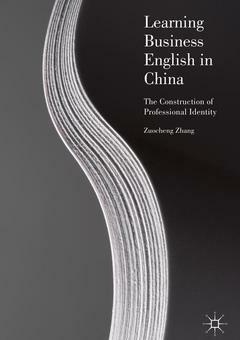 Discursive construction of professional identity.- Chapter 7. Reception of students' professional identity construction.- Chapter 8. Towards a model of learning Business English learning and professional identity construction. Zuocheng Zhang is Senior Lecturer in TESOL Education at the University of New England, Australia. His publications include monographs and textbooks on Business English and business discourse.